In this week’s issue, we have some more fabulous reading for you. It’s pretty diverse, ranging from classics to cookies. Henry L. Carrigan, Jr. returns (temporarily) with an overview of one of America’s finest writers and a book that should, in his opinion be on every Best Books list (especially if it focuses on Southern literature)—James Agee’s A Death in the Family. Agree would have just turned 100 years old this past weekend had he not died an untimely death at age forty-five in 1955. But what he left behind among other things was this unfinished book that his literary executor edited and that won him a posthumous Pulitzer Prize. Two different editions have been recently published, and Henry explores not only the nuances of Agee’s role in Southern literature but what these two books bring out in The Resurrection of James Agee. Pete Croatto has what he terms “sports fan DNA’” coursing throughout his body, and since 1996 has been addicted to SportsCenter. Unfortunately for him, what brought him there— Dan Patrick and Keith Olbermann—live only the book, The Big Show: A Tribute to ESPN’s SportsCenter, a Christmas gift in 1997. The book continues to be a big part of his adult life in unexpected and comforting ways as he shares in In Adulthood, Book Takes on a Second Life. Cookies and Christmas are, for David Mitchell, firmly intertwined. Not that he bakes them. Rather, he savors the Dickensian role of cookies during the holiday season, “walking into my home on almost any day in December to be overwhelmed by the mouthwatering aromas of freshly baked Christmas cookies coming from my kitchen” as an accompaniment to a good book. Share his joy in Eat, Drink and Be Merry, for Tomorrow We Dine. Lauren Roberts, who has a whole gaggle of links to literary gifts lined up and ready to share beginning next week uses this week’s letter to share some ideas on the Christmas season. If financial uneasiness is looming that may mean making emotionally difficult decisions about the holiday. Yet if this past Black Friday weekend is any indication of how shopping is going then it won’t be much different than in the past. Regardless of others’ decisions, Lauren suggests, forgo all “traditions” that don’t make you happy or that cause stress and build your own “traditions” beginning this year in Dashing Through the Season. All of us at BiblioBuffet wish all of you a happy and healthy week. Do good. Be good. Have a good time. What is being served in each of our contributors’ households for the big meal? Well, turkey is fairly common but the other dishes are wide ranging. Here’s a preview peek into the various Thanksgiving menus. Lauren Baratz-Logsted: I don’t have a menu, since I’ve never cooked a T’giving dinner in my life, nor would the world want me to. We’ll go to my brother’s. There will be a turkey and traditional meal which will be a challenge for me since I went vegan six months ago. So I’ll modify my diet for the day, just so I won’t make everyone else crazy. I still won’t eat the meat, but I’ll eat the things that have dairy in it. It’s either that or only have wine and salad, which would be fine with me but not so fine with everyone else when I get drunk too early and get the bedspins. Lindsay Champion: I’m going to my aunt’s house for a late Thanksgiving on Saturday. I think the menu is a traditional turkey and yams type deal, but they are Italian so I think there is going to be a big pot of pasta as well! Pete Croatto: Roasted turkey with gravy and stuffing, mashed potatoes, string beans, crescent rolls, and for dessert, if I’m not too uncomfortable, pumpkin bread and coffee. This might be difficult to predict seeing how I don’t know the line up of pies at this point. Nicki Leone: Roasted turkey with herbed cornbread stuffing and cider gravy; roasted beet salad with oranges and beet greens; Brussels sprouts with buttered pecans; confetti wild rice salad with walnuts, dried cranberries and tarragon; homemade sourdough bread; curried sweet potato soup; honey-pumpkin pie; caramel apple pie with vanilla ice cream. David Mitchell: Sushi (vegetarian and smoked salmon); roast turkey; gravy; penne with Fontina and mascarpone; whipped sweet potatoes’ roast green beans; steamed broccoli; buttermilk rolls; cranberry sauce; pumpkin pie; blueberry ginger buckle; assorted pastries and cookies There are only four of us at our Thanksgiving table and it is a challenge to serve. I do not eat red meat or poultry. My elder son will not eat any vegetables. My wife and younger son will eat everything but my wife will eat only a small volume of food. Lev Raphael: We’re dining à deux because it’s our 25th anniversary and we wanted the time alone. We’re seeing family and friends on other days this coming week. The menu is simple: filets mignons Bordelaise with Brussels sprouts au gratin and a bottle of Pauillac. Dessert will be a local vanilla Gelato. Lauren Roberts: Assorted olives; roasted turkey with herb gravy and bread, onion, & apple stuffing; homemade cranberry sauce; green salad; steamed green beans with sage butter; fresh rolls; mashed potatoes; pumpkin pie with whipped cream. In this week’s issue, we have some fabulous reading for you. We also have a new feature that we believe (and hope) you will enjoy. That feature, which we mentioned here about a month ago, was Lauren Baratz-Logsted’s idea: The Disrespectful Interviewer. It’s common for literary websites and blogs to interview authors, but how many offer an “intrepidly disrespectful correspondent [who] is as rude as she likes with prominent writers of the day”? We permitted ourselves to be the only one, and author Jon Clinch graciously allowed himself to be the first victim interviewee in this semi-regular feature. Bookmarks are often made with specific purposes in mind—advertising is a prime example. Sometimes, though, people take them and make them personal with notes and messages that make them meaningful to the recipients. But when that recipient is gone and the bookmark comes into other hands such notes become cryptic mysteries that beg investigation. Laine follows three such bookmarks to a satisfying if not entirely conclusory in Keep for a Bookmark. Nicki Leone runs her life with her hands in many pies. In addition to her duties with the Southern Independent Booksellers Association, performing her Lady Banks’ role, and keeping her blog, this past week she has also been hosting her parents and helping run the North Carolina Writers’ Network Fall Conference. Whew! That’s enough for anyone so I have asked her to put down her pen and enjoy a small vacation from her deadline. This week, we are rerunning a superb piece she did that will cause every book lover to either cringe in horror or stand up and applaud in No Respect! Which group you fall into will depend on how you treat your books. Thanksgiving is not just one of Lauren’s two favorite holidays of the year, but the opportunity to shut out the shopping world and indulge a marathon of reading. Yup, it’s the second annual Great Thanksgiving Weekend Read. What’s in it this year? Come see. All of us at BiblioBuffet hope you enjoy this issue. We wish you a wonderful week! Even passionate book reviewers can feel overwhelmed with books at times. When I go to the post office and see half a dozen book packages or boxes I get excited. (What book lover wouldn’t?) But opening them is a little different. Not all interest me. Sometimes none do. 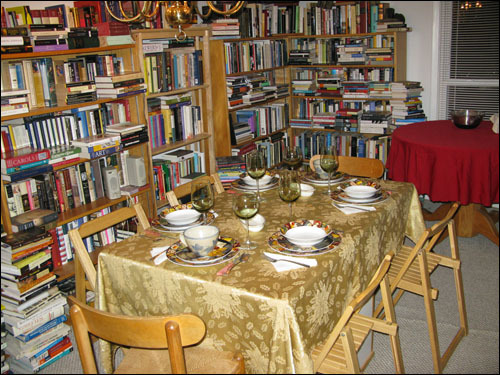 Many, of course, go out to BiblioBuffet’s reviewers to await their turn in the reviewer’s spotlight. Right now, there are six books for review on my desk, the oldest of which has been there for, um, a while. Like cats, they are very good at instilling guilt—their equivalent of “I’m starving!” is “I haven’t been read!”. Reviewing books is a matter of picking and choosing. It has to be. There are too many good books published and too few good reviewers to do enough of them justice. Even if BiblioBuffet had 100 reviewers writing weekly we couldn’t cover even a small fraction of what is published on an annual basis. Not that we would try. There are a lot of good books in which no one at BiblioBuffet has an interest, or that are inappropriate either because they are in a genre we do not review or because they were self-published or vanity-published. That still leaves a whopping number of worthy books. So when I am faced with that, what happens? First, I e-mail the reviewers to find out who wants what. Sometimes, if I know a book will be of interest to a particular reviewer, I contact that person first. But often the e-mail is a group one, and whoever gets back to me first gets the book, especially if more than one reviewer wants it. What happens to the books that no one wants? That was recently the focus of a week-long discussion on Book Balloon, the literary forum to which I belong. Its main question: Why shouldn’t reviewers sell the books they get for free? And why shouldn’t buyers save money by buying the ARCs (advanced reader copies) that other reviewers are selling on Amazon or eBay, or that they have sold to the Strand Bookstore? Some members feel it is their right to cheaply priced or pre-publication copies, that is, unfinished, books. Managing Editor Nicki Leone and I are adamant that selling books we receive for review (whether they are reviewed or not) and don’t intend to keep are never to be sold or given to a person or entity who is going to sell them. In fact, one of the few rules we have for contributors is that this is not allowed. How do we enforce it? Well, we can’t. All we can do is be clear about our policy in our Writers’ Guidelines and rely on our contributors’ ethics. The reason for our stand is two-fold. First, ARCs are unfinished books. They come with a warning that they are not to be quoted from as they are still in progress. They also have a large “Not for Sale” notice on them. These are not meant for the marketplace because the editing and rewriting is still going on. So if you read an ARC you are not seeing what the author and editor intend you to see, and if your opinion of an author’s work—especially if you talk about it on Library Thing, Amazon, in a book club, or elsewhere—is based on the unfinished version that may well do damage to the book, the author, and the publisher. It also cheats the reader of the true experience. We feel strongly that it does not matter that the publisher prints ARCs specifically to be given away because the publisher does not, in our opinion, relinquish their rights to their disposition of it after it leaves their offices. The book is not designed to be sold in the normal manner of business, thereby benefiting the publisher and author. Note that I am not talking about a re-sale but the initial sale. When you buy a book, part of the price you pay is returned to the publisher and then onto the author and her agent. A profitable return is what keeps everyone in business, keeps them writing and producing more books for readers to buy. But when the marketplace decides that its “right” to rip off the publisher and author is more important than supporting them it risks wounding, perhaps, over time, fatally, the business that produces the product it wants. If you are a book reviewer and you benefit financially from anything besides the fee you receive for your writing, then you are being an unethical journalist. No gray area there. It’s an issue of transparency and accountability. If we make money from something we are reviewing, our legitimacy is compromised. If we in any way financially benefit from something we are reviewing, besides our paychecks for writing the columns, our legitimacy is compromised. The system in place is such that for all published books—and newly released films, issued DVDs, etc.—the creators of the product get a share of the first sale. It’s how they are paid for making the book. Anything that ends up on the market that bypasses that first sale cheats the author and publisher. It doesn’t matter if publishers “know” that review copies end up on eBay or at the Strand. It doesn’t matter if the book “given” out is an unpaginated advanced reviewer copy, an uncorrected proof, if it is stamped “not for sale” or if it is a finished copy and there is nothing to distinguish it from from one on the shelf at the bookstore. It was provided to reviewers or booksellers for a specific purpose and it is as unethical for them to turn around and sell it as it would be for a DVD store to play their movies and charge a ticket price. As the founder of BiblioBuffet , it matters very much to me that my credibility as a literary website owner, and as a book reviewer, is spotless. It also matters that BiblioBuffet’s reviewers take their credibility as seriously as I do. It matters that our readers know that what we state about a book is our honest opinion, that no influence has come down, that we hold to standards of journalistic professionalism, and that we continue to hold to those standards after the review is done and finished. BiblioBuffet takes pride in its commitment to integrity and honesty. We treat not only our writers with respect but you, our readers. Furthermore, we act with the highest regard for those who work with us to get you information on books: the publicists, editors, publishers, and authors. Because when it comes to ethical standards, there isn’t a slippery slope. You are either on one side of the line or you are on the other. BiblioBuffet stands proudly on the ethical side. It’s a new week and a new issue. Because our columnists write on a bi-weekly basis, the ones listed below are new as of this week. Thanksgiving means food, so Lauren’s bedtime reading in the last week has consisted of newly arrived cookbooks that have her dreaming, especially, of lovers and onions in Like Lovers. And as in all the editor’s letters, you’ll find special highlights: The Pub House, Of Interest, and This Week. Each has been personally selected (no trades here) and comes with her own recommendation. Lev Raphael has been asked to donate his papers to Michigan State University Library. Such a request is an honor for any writer, but what does it actually mean? Lev shares his experiences—the discomfort, the pride, and the work involved in this enormous project—and his feelings about it all in In the Realm of the Archives. Even non-sports people know the names of Larry Bird and Magic Johnson. But what many people, followers or not, do not know is the “humanity behind their historical significance” of these two true sports stars. Pete tackles a book that tells this story and comes up with a strong recommendation in Inside Moves. Religion, faith, love, and hope are deep and sometimes divisive waters. David wades into them when he explores not only a new book of the differences among them, but ends up sharing his own journey that follows a similar path in For What It’s Worth. Don’t forget to check that six days a week we have new material for you to enjoy on our Literary Amusements page. Literaria du Jour offers a literary factoid; Reading Remarks offers quotes about books and reading. It’s a quick read, but a most enjoyable one. Literary agent extraordinaire Janet Reid stunned me by posting a link to this blog last night. Now Janet and I are casual friends. I met her online several years ago in . . . uh, circumstances which must go unnamed due to privacy issues. Then in 2008, the publishing industry’s trade show, BEA, was in Los Angeles. She came out, and I met her then. I liked her a lot. She seemed to like me too. Anyone who reads her blog knows that Janet takes pride in presenting herself as a curmudgeon, but what her curmudgeonly persona hides is a beautiful person who simply does things in her own time and her own way. Last night was one of those. I checked her blog as I do every day for a good laugh or a raised eyebrow. And I nearly fell off my chair. I didn’t do that, but I did end up knocking the cat off my chest as I gasped at her latest post. Where did that suddenly come from? I have no idea. But it made me burst into tears before I recovered myself and promptly e-mailed all of BiblioBuffet’s contributors to tell them of it. I also sent Janet a very enthusiastic e-mail thank you, but haven’t yet received a response. No problem. She’s busy. And thank-you notes don’t require acknowledgment. Anyway, I will have the opportunity to tell her how much we all appreciate it when she comes out to Los Angeles in March for the Left Coast Crime Mystery Convention and, maybe, comes to visit for a few days. I’ve got my fingers crossed. Janet, if you come I promise to have the whiskey on ice and the Godiva on the nightstand. Tagged as Janet Reid, Links, OMG!